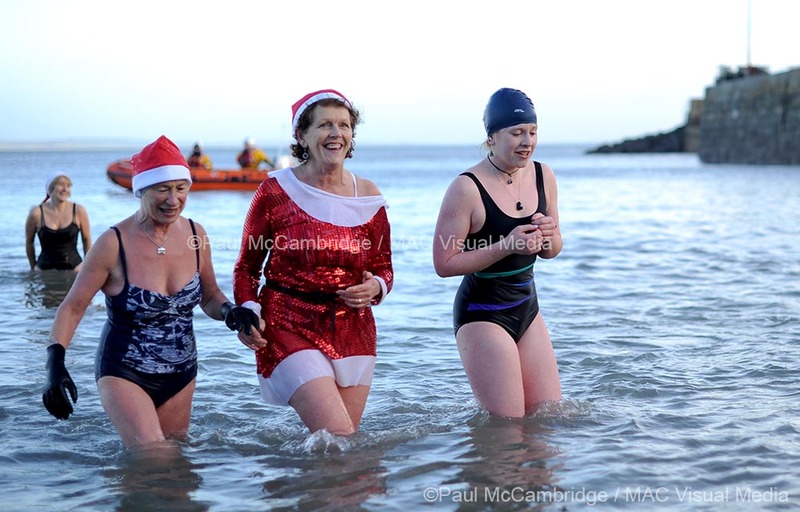 1 Saturday 20th December – Christmas Dip! 2pm Helens Bay, Co Down. A social swim or dip. Posted on facebook; Northern Ireland Outdoor swimming. 2 Sunday 21st December – Camlough Lake, Co Armagh, Ireland Ice Swimming – training session for Ice swimmers; 10am. 3 Sunday 21st December – Santa Splash, 1pm Arcadia, Portrush, Co Antrim. Donations to Marie Curie. 4 Wednesday 24th December – PIER 2 PIER WINTER SWIM, Carlingford, Co Louth, 1.45pm for 2pm start. Charity donations requested. There is no entry fee just a bucket collection on the day and all proceeds go to Carlingford Day Centre. there will be a waiver to sign….. Annual Christmas pier to pier swim in carlingford Christmas Eve assemble on King John’s Pier at 1:45 for 2pm swim across to the south pier. This annual swim has become a traditional part of the carlingford Yuletide festivities and all monies raised in the bucket collection are donated to the Carlingford Day Centre. Approximate distance between piers is 150 metres. Wetsuits are optional but HIGHLY recommended. 5 Christmas Day – Newcastle Harbour; 10.30 am. Charity donations requested. Newry and Mourne. 6 Christmas Day – Myrtleville, Co Cork. 7 + 8 On Christmas Day and New Years Day – everyone will meet on Portmarnock beach, Co Wicklow. 9 New Years Day 2015 – Ice Swim Ireland Training; 12 noon, Camlough Lake, Co Armagh.